You are visiting the "Drovers" page. The links in the box to the right will take you to sub-pages within the "Drovers" section. The links with asterisks in front will return you to either the parent or "Home" pages. Click on any thumbnail image below to view the picture; then click on your browser's "back" button to return to this page. It is well known that Beardie-like dogs were used by drovers in the movement of cattle. 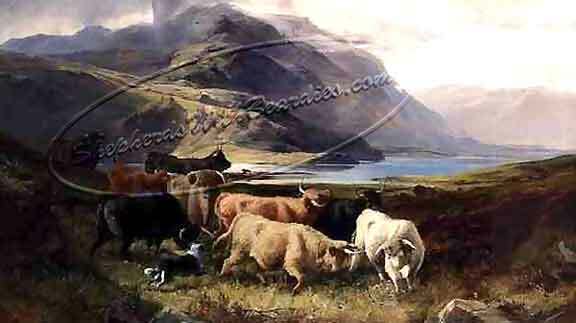 The two images below, painted by Joseph Denovan Adam, are wonderful representations of what occurred when cattle were moved along Highland trails. The first image was signed by the artist and dated 1878. It hangs in the Stirling Smith Art Museum in Stirling, Scotland. 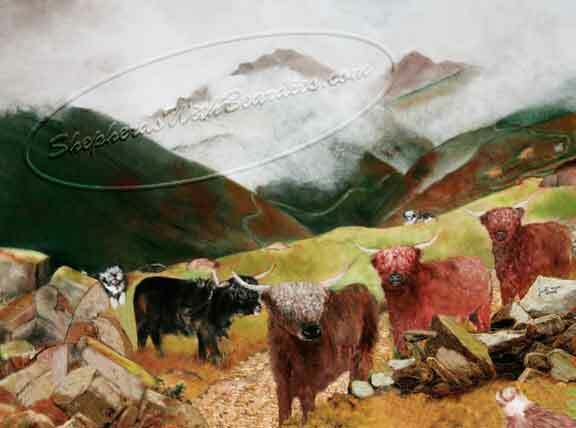 When viewing the painting close up, one sees a long line of Highland Cattle following the leaders on the trail. Unfortunately, due to low resolution, it is difficult to view the followers. Adam owned his own Highland Cattle and was very familiar with them. 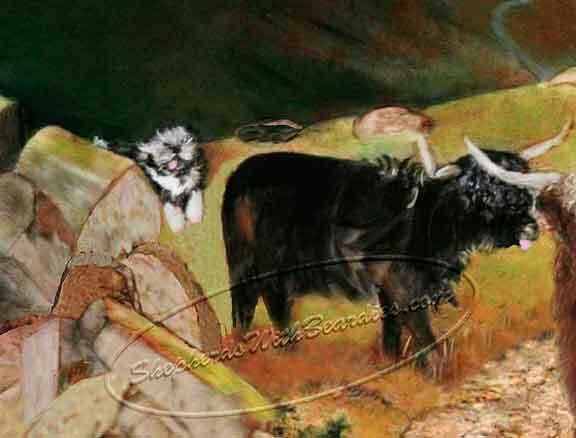 This second image shows a Highland collie working the Highland Cattle in the hills. One cannot say it was a Beardie-like, but certainly Adam was familiar with the "collie" type of dogs, but to say it was any particular breed would only be speculation. Moving of stock over Britain's drove trails no longer takes place other than those instances where individuals recreate a drove for pleasure, or for film. Although drovers drove numerous kinds of stock (sheep, geese, turkeys, cattle, etc. ), this website will focus on the drovers' movement of cattle to grazing lands or to market. Unfortunately, there are few images that document their hardships. To understand, we must rely on written documents and drawings/paintings to bring some of the imagery from that era (mid-1600s to mid-1800s) to life. Only a small amount of material will be presented regarding what many of those drovers and their dogs (to include Beardie-like canines) encountered on arduous journeys to include: pushing the cattle to swim across the water between an inner island such as the Narrows between Kylerhea on the Isle of Skye and Glenelg on the Scottish mainland, or across Scottish Lochs (lakes) or rivers in all areas of Britain, or getting cattle to load onto ferries when the water was too deep to cross in any other manner, or over land to include trails through the mountains. 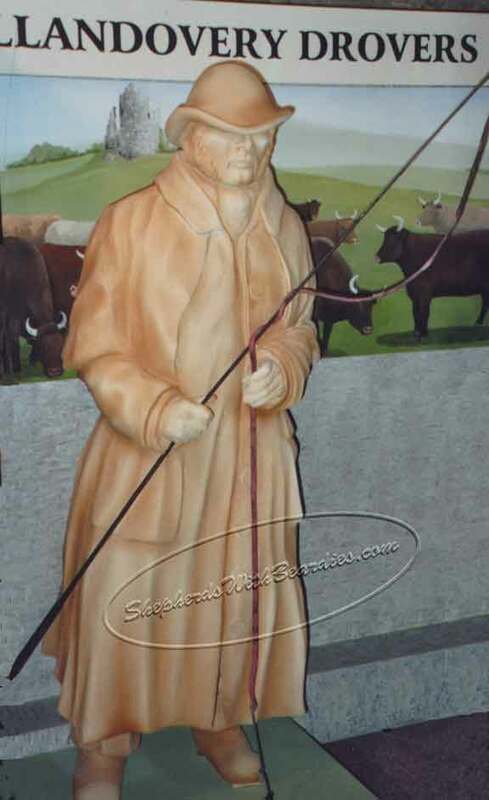 What did a drover look like? We received some images from David Gealy, a retired local historian, from Llandovery, Carmarthenshire, Wales, of statutes in tribute to those drovers who gave their community a legacy for having once been an important droving centre. Llanymddyfri (Llandovery) was an important drovers' town. by drovers to London from Wales each year." 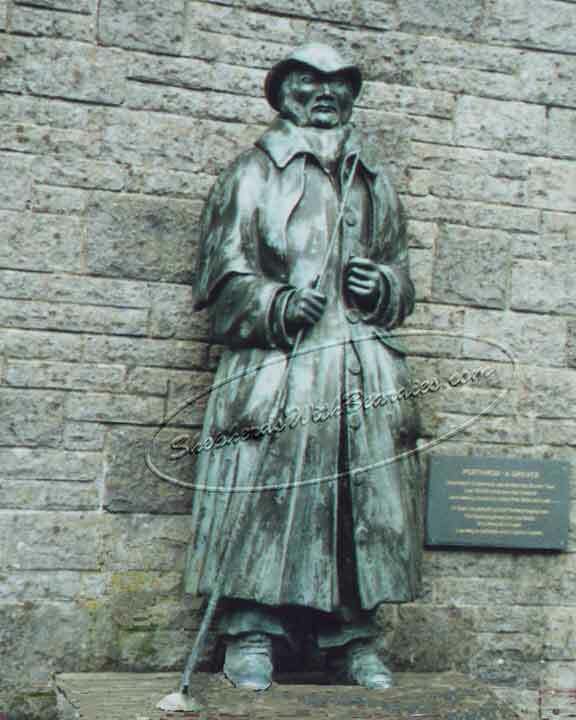 Another representation of a drover is housed inside the tourtists' information centre at Llandovery. The next image has been cropped and placed on a darkened background. 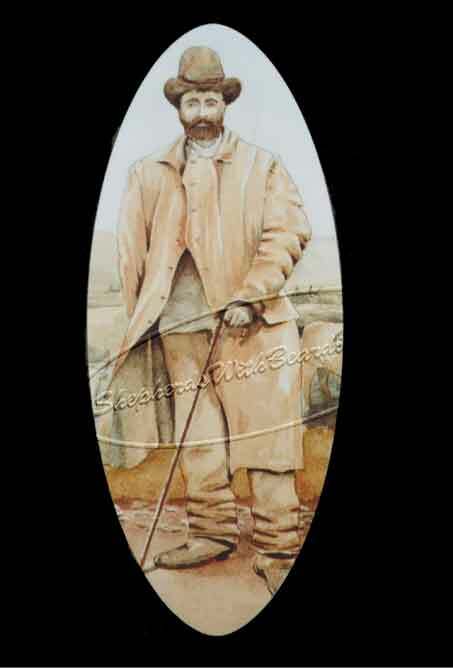 The painting shows a drover and hangs on a wall in the clubhouse of the Llandovery Rugby Football Club (the team is known as the "Drovers"). This same image of a drover also appeared in Richard Moore-Colyer's book Welsh Cattle Drovers. 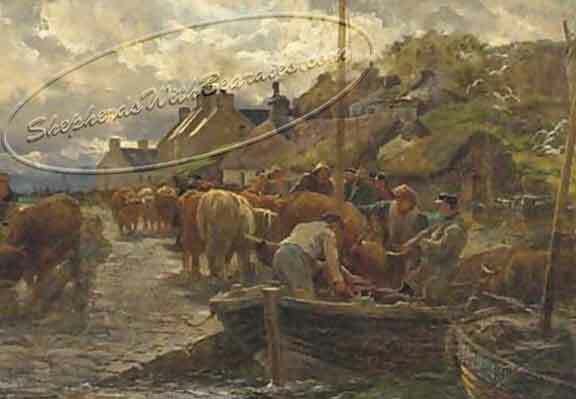 The two images below shows how cattle swam across water depending upon the water current (sometimes not all the cattle made it across) and cattle being loaded onto a ferry boat (fortunately, an artist saw such a scene on the Isle of Skye). 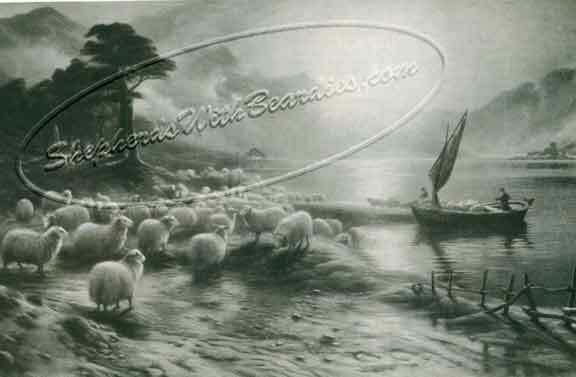 In the next image, one can clearly see sheep that had been ferried across a loch; they appear as though they were leaving the ferry to join the flock waiting on shore. The drovers' days were long. They would rise early hoping to move the herd around 15+ miles per day depending upon weather conditions and the condition of the land they were traversing. Often they would cross on open grasslands, but in many areas, trails were established and used. 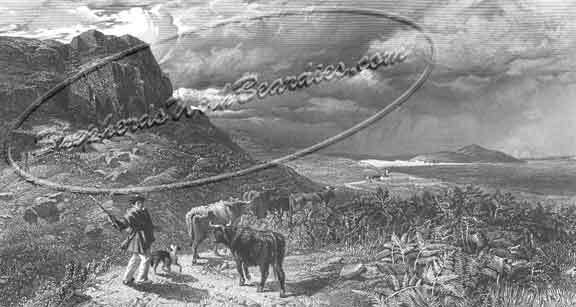 The below etching reflects a drover and his dog moving cattle on a trail winding along the rocky coastline. The image shows the potential for a storm off in the distance. Not only did the drovers have to deal with all kinds of weather, they often slept on the ground (as opposed to an inn), eating a simple breakfast of oats (sometimes mixed with blood drawn from the cattle referred to as "black pudding"). Problems the drovers faced were not only the inclement weather but straying cattle and the potential of Reivers (who would steal their animals particularly in the borderlands). Many stories have been handed down to us where Beardies were often used to protect the money from robbers while drovers were on the move. 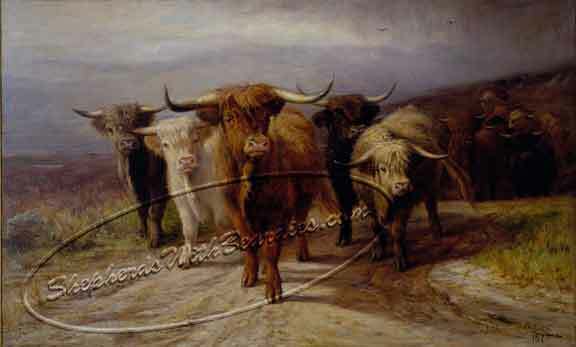 Richard Beavis (1824-1896) did a painting of the Border Reivers. Entire families banded together to steal cattle. 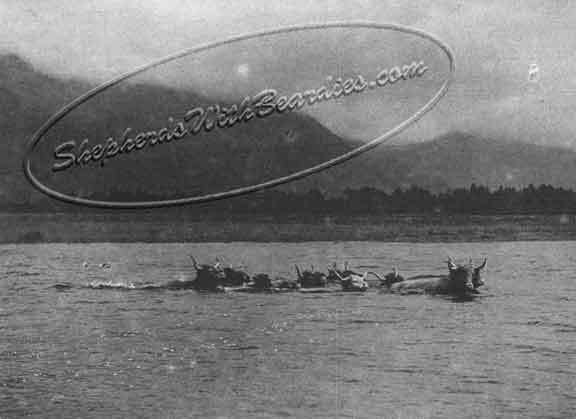 Eventually steamships were built and used to move cattle. Then, railways also began to be used. Eventually, the lorries (trucks) also were involved in the operations. Drovers were no longer needed. It is well known that Beardie-like dogs held favour with many of the cattle drovers, not to mention the butchers, once the cattle arrived at the markets. The below image appeared in The Illustrated London News in September of 1865. 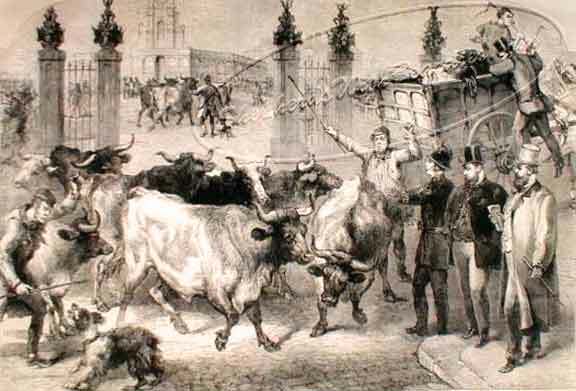 It was entitled "Inspection of Foreign Cattle at the Metropolitan Cattle Market." Buyers dressed in suits appear as onlookers. The herdsmen were waving their goads (spiked sticks) in the air in order to keep the cattle directed. In this image, it appears that the cattle were putting up some opposition regarding the direction they were supposed to go. In the lower left hand corner of the image, a Beardie-like dog was barking to assist in getting the cattle heading in the right direction. One cannot tell if the dog had a tail. Many Beardies were known to possess stumpy tails (due to taxation issues discussed elsewhere in the "History" section). But clearly the dog had ears similar to a Beardie, a shaggy coat, and large feet. Regarding the two images presented below, just imagine you are in a mountainous area in Scotland where Highland cattle are being driven along narrow pathways lined by rugged ground and rocks (dating back to volcanic activity in the area). 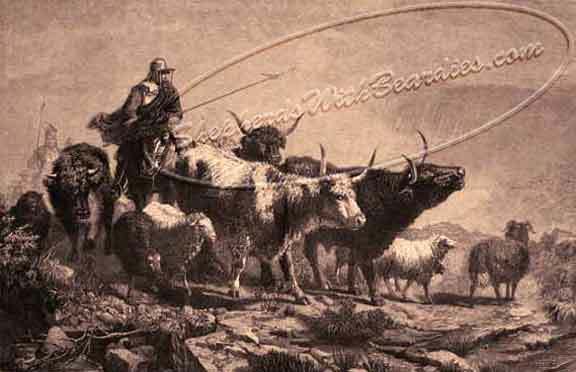 Often Beardie-likes were used by drovers to make sure the cattle stayed on the trails. The dogs heavy coats protected them from the inclement weather conditions; their pads could handle the rough ground. In the first image, notice the placement of the Beardie in the background; one is lying on the ground cover ready to rise if the cattle begin to stray. A brown Beardie is in the lower right foreground making sure the cattle do not move in his direction. A third Beardie is returning a stray to the herd. In the close-up view of the image, one can see a representation on how a Beardie might just have been running up a hill behind the bellowing animal. Both animals appear to be a bit winded (tongues handing out). You are invited to visit the other pages in this section.